some of our favorite pieces of retro 1950s americana now available as tree ornaments! 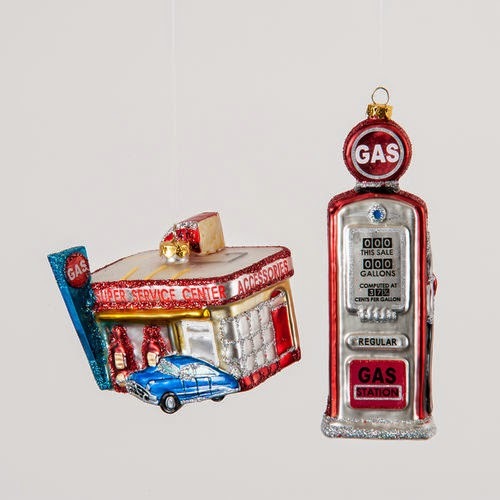 our fabulous 'retro gas pump and service center' tree ornament set was inspired by the classic 1950s roadside attractions. these tree ornaments are highly detailed and will spruce up any tree. intricately detailed for plenty of personality, each tree ornament is truly one of a kind. our beautiful ornaments are expertly crafted from mouth-blown glass, then hand painted and given glittery accent finishes. this beautiful retro 1950s style tree ornament set will be expertly packaged to ensure safe travels. the perfect gift for just about anyone that likes the golden age of travel! price is for the set of 2 (two) ornaments as pictured. sleek, shiny, and ready for the open road, this was travel during america's legendary golden age of road travel...the 1950s. these beautiful ornaments evoke technicolor memories of travel during simpler times. both the gas pump and the service station are widely considered to be the most influential examples of modernist americana.